AND you return the item within a reasonable time after purchase and provide Sussan with proof of purchase, such as your original Sussan receipt or bank statement. If you do not return the item within a reasonable time, you will not be entitled to a refund of the purchase price but you will be entitled to exchange the goods or have them repaired.If you are entitled to a refund but you would prefer to exchange the item or receive a Sussan gift card of equivalent value to the item, Sussan is happy to exchange or give you the gift card instead of a refund. 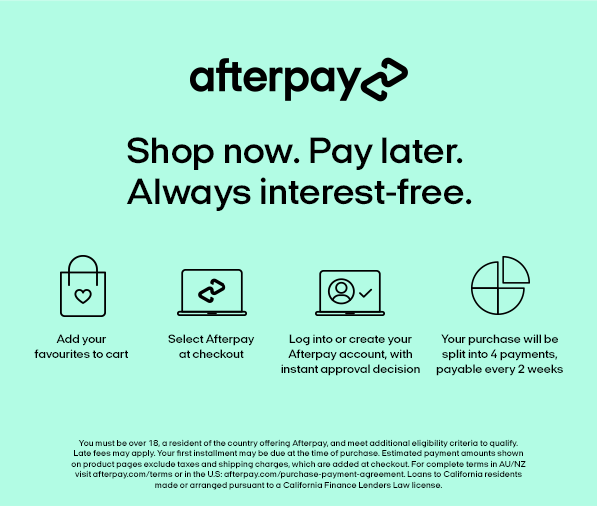 Afterpay is currently only available for online purchases within Australia at www.sussan.com.au, and not at Sussan stores. If you require a refund in line with our Returns Policy, all returns on purchases made via Afterpay must also be returned via post to the Sussan Online returns address, for a refund. Sussan stores cannot currently process exchanges or refunds with Afterpay. If you are returning a faulty or incorrect item where you have used Afterpay, please contact us in advance with your Sussan online order number, to arrange reply paid post. With online refunds and/or in the event that an item from an Afterpay purchase cannot be fulfilled, your Afterpay balance will be reduced to reflect the new order total which can take up to 5 business days after the refund has been processed. For additional information please view the Afterpay terms here. Sussan is not legally obliged to give refunds of the purchase price or gift cards on items, or exchange them, simply because you have changed your mind about the purchase. Afterpay purchases, must comply with our full Returns Policy. You can also see additional information here. How do I return items I've purchased online? We have an extended return period for Christmas orders and gift purchases made from our online store. Customer will have until 5th January 2019 to return back to our warehouse. If, for any reason, what you’ve purchased is not suitable we are happy to offer you a refund (or exchange in store for Gift Card, PayPal, Debit or Credit Card orders). You must return any items within 14 days of receiving your parcel. For hygiene reasons you cannot return earrings, cosmetics, lingerie or hosiery. For in store returns you must show the tax invoice for your order. If you would like to exchange your item, you will need to return it to our online store for a refund and place a new order, or take it into any Sussan store. To find your closest store, please use our Store Locator. Go to https://returns.auspost.com.au/sussan-online-returns or click the ‘Online Return Form’ in the site footer below. Print your return label with your order (the label will also be emailed to you). Don't have a printer? No problem. You can print your label at a post office - just show the confirmation email on your mobile device and they can print it for you. Fill out the bottom section of the return form that came with your parcel and include with your return. Then lodge your item at a post office, or drop it into a red street posting box (if size permits). Take your parcel to the counter at the post office if you want a lodgement receipt with a parcel tracking number. Once we receive your parcel we will process your return and you will receive a confirmation email. For faulty items, please contact us to have your items returned to our online store at no cost to you. You can return any items from Click & Collect orders in store (excluding Afterpay purchases. Please see below) or by using our return service. We recommend you send your goods back using a trackable delivery service as Sussan does not accept responsibility for items lost in transit. Once we receive your parcel we will process your return and you will receive a confirmation email. Refunds will be credited against your original method of payment, excluding delivery charges. What do I do if my purchases don’t fit? We have a flexible Returns Policy to make online shopping easy and convenient. If you wish to return an item we will offer a refund or exchange (in store only) provided you return it within 14 days from the date you receive it, unworn and in its original condition with labels/tickets attached. You cannot return earrings, cosmetics, lingerie or hosiery. if you return in store you must show your order Tax Invoice. Unfortunately we can’t accept online exchanges at this stage; however you can take your item into any Sussan store for an exchange (within Australia. Excludes Afterpay purchases). Please show your order Tax Invoice for any in store exchanges. For international orders, if you wish to exchange your purchase, you will need to return it for a refund and place a new order. Unfortunately, once your order has been placed we are unable to cancel or change your order. However, once you have received your goods you can return them for a refund. For full details please see our Returns Policy. What if I returned an item and it was incorrectly refunded or replaced? We automatically issue a refund if an item is returned, so you can purchase another item you would like instead. If you think you’ve been refunded an incorrect amount, please contact us and we will solve this problem as soon as we can. We’ll send you an email letting you know as soon as we have processed your refund. If you haven’t received this email within 10 days of posting your parcel to us, please contact us. Please note, during peak promotional periods such as VIP sales, Mother's Day and Christmas, you may experience a delay in processing your refund. We apologise in advance for any inconvenience. Sussan gift cards are non-refundable, non-transferable and cannot be redeemed for cash. However, gift cards are valid for a twelve month period (3 years in NSW) and can be used in conjunction with any sale in store (unfortunately, at the moment gift cards cannot be redeemed in our online store). Please download our online return form below.